Scientists from NAST Centre are now able to capture previously elusive details about ancient Italian violins, by Amati and Testore, and the Egyptian grave-goods of Kha thanks to a new instrument, IMAT, which has the ability to reveal hidden images of these objects for the first time. The study is performed within the ARKHA project. IMAT was opened today in the presence of H. E. Pasquale Terracciano, Italian Ambassador in London, by Corrado Spinella, Director of the Department of Physics of the Italian National Research Council (the CNR) and ISIS Director Robert McGreevy, in a celebration of the long-standing partnership between the UK and Italy. The new imaging capabilities of IMAT enable scientists to access key information on the effects that the choice of different materials in violin has on the sound they produce, as well as the methods used by ancient Egyptians to make vases and alabasters. Cultural heritage studies of this kind, along with a number of other research areas, have expanded as a result of the Italian collaboration with the ISIS Neutron and Muon Source, a research facility supported by the Science and Technology Facilities Council. The agreement between CNR and ISIS was originally signed in 1985, making Italy one of the major and longest-standing partners of the research facility. Today, the relationship between ISIS and Italy was celebrated with the opening of IMAT, the first instrument at ISIS capable of producing 3-dimensional images to reveal the inner workings of components across a wide range of science and technology areas. Antonio Stradivari (1644 – 1737) was one of the greatest luthiers of all time. His interpretation of geometry and design for the violin has served as a conceptual model for violin-makers for more than 300 years. 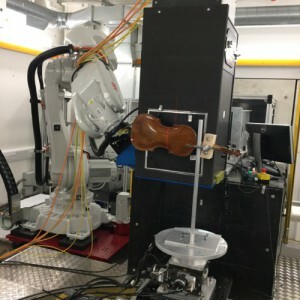 Today a team of scientists from the Italian National Research Council CNR, Tarisio (London), Fondazione Pro Canale (Milan), University of Milano-Bicocca and University of Rome Tor Vergata, are investigating the craftsmanship of ancient Italian violins using neutron beams. The team wishes to explore how the wood, only a few millimetres thick, was used to construct the instrument, and how small details in the finishing and varnishing processes influence the sound production. Due to their peculiar shape and high value, violins are difficult objects to study with standard analytical techniques. 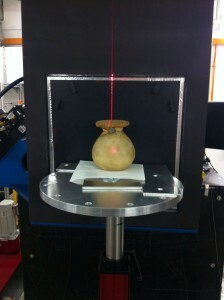 IMAT offers a non-destructive method by which the entire instrument can be imaged. 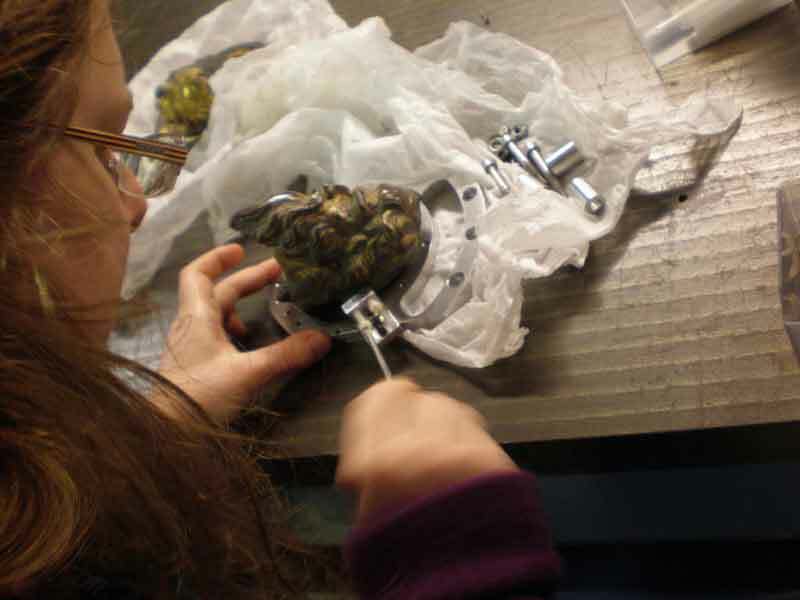 These experiments form part of a wider project that aims for the integrated analysis of musical instruments. More than 3,000 years before Stradivari’s time, between 1425 and 1353 BC, Kha was overseeing the building of tombs for the kings of ancient Egypt. Previously, all that was known about Kha was taken from his mud brick funerary chapel. Until 1906, when an Italian archaeological mission discovered the shaft of Kha’s own tomb that had been sealed by a landslide. It was the richest and most complete non-royal burial assemblage ever found. Kha’s grave goods included coffin tunics, beds, vases and prestigious luxury objects inscribed with royal names, as well as alabaster containers, ceramic vessels and jars for food, oil powders and perfumes, some of which still remain sealed with their contents unknown. Now, a selection of the Egyptian artefacts taken from Kha’s tomb, including vases and alabasters, are being studied on IMAT as part of the ARKHA project. Using neutron beams, which have a high penetration power in metals, the team will find clues on the methods used by ancient Egyptians to make the bronze vases and pots, as well as the state of their conservation. 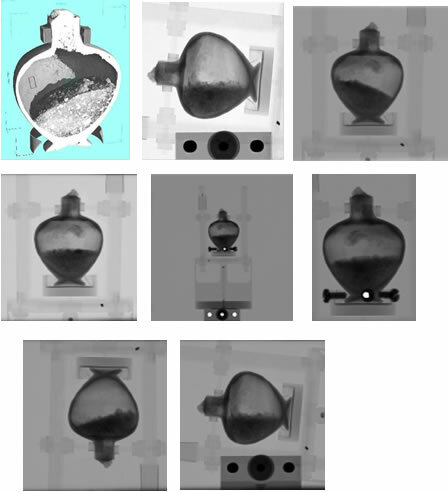 The neutron tomography of a sealed alabaster vessel from the Egyptian Museum of Turin reveals the elemental composition of its contents. Christian Greco, Director of Museo Egizio said: “On the 2nd of October, 11 vases from the funerary goods of the tomb of Kha have been sent to the ISIS laboratory where they will be studied with the help of neutron beams in order to discover what is hidden inside these precious objects. We strongly believe in the collaboration between archaeologists and researchers in Chemistry and Physics that this project aims at promoting. It is an especially important initiative this year which marks the 110th anniversary of the discovery of the tomb of Kha by Ernesto Schiaparelli, dating back to 1906, because it represents an opportunity to offer to the public new data and useful new results about the objects belonging to our collection”. ARKHA (ARchaeology of the invisible: unveiling the grave goods of KHA) project. 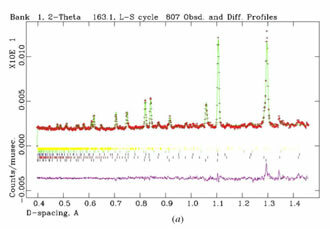 Objective of the study is to characterize the “Kha and Merit collection”, by the integrated use of non invasive and non destructive chemical and physical techniques by the integrated use of light and neutron probes. ARKHA combines competences of scientists belonging to different disciplinary fields, i.e curators, restorations, Egyptologists, archeologists, chemists and physicists. 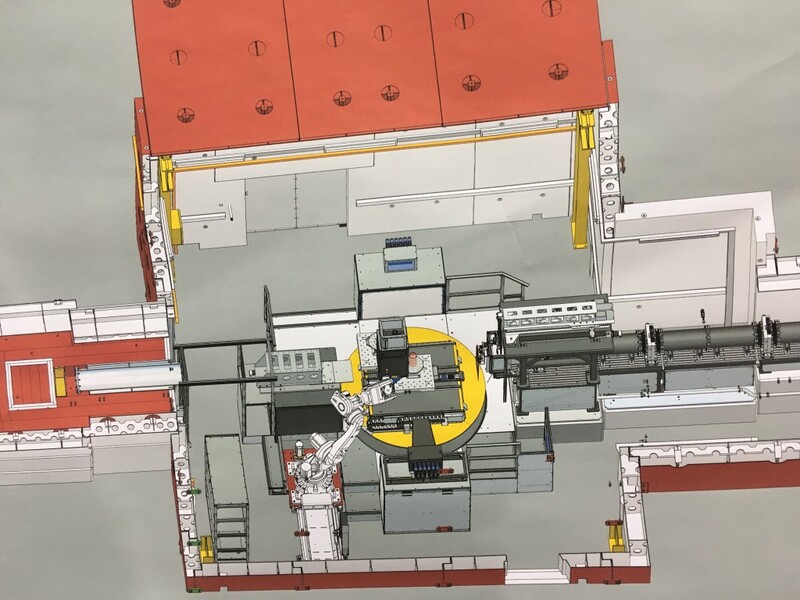 The IMAT beamline is a new instrument at the Science Technology Facilities Council’s ISIS Neutron and Muon Source. It will be the first instrument at ISIS capable of producing 3-dimensional images, revealing the inner workings of components across a wide range of science and technology areas. The images produced by IMAT will have applications in the areas of aerospace and transportation, civil engineering, power generation, earth sciences, cultural heritage and agriculture. 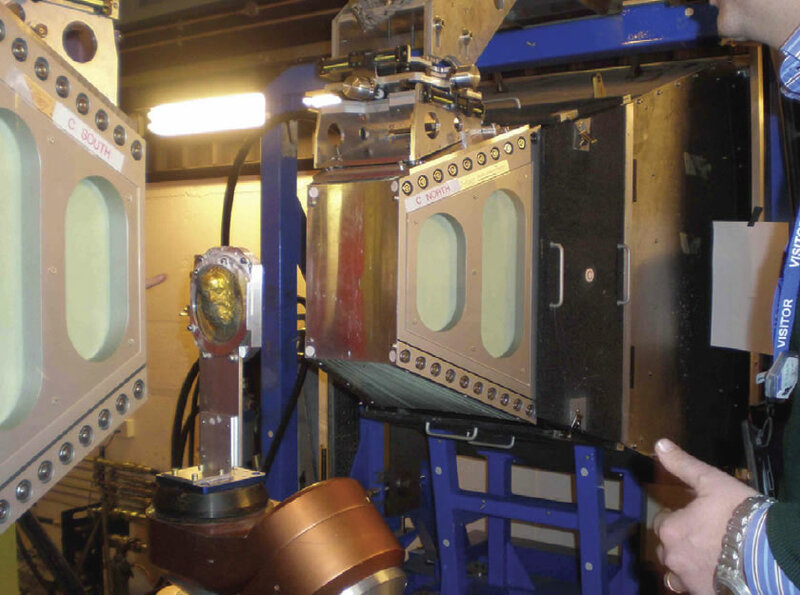 As neutrons can penetrate deeply into materials, IMAT will be capable of producing images of the internal structure of large engineering components. It will reveal, for example, the passage of lubricants and fuel through engine components, and the internal stresses and strains inside welded components. IMAT has been built using funds provided by the UK government, together with imaging systems developed by Italian scientists from CNR-IPCF, funded through the Italian CNR research council. A large collection of artifacts from the Egyptian Museum of Turin was studied for the first time using analytical techniques. The study is performed within the ARKHA project. The collection is part of objects coming from ­one of the tombs discovered by Ernesto Schiapparelli’s Italian archaeological mission. In 1906 the archaeologist discovered the shaft of an underground tomb, containing the intact burial assemblage of two upper-class individuals, ‘the director of works’ Kha and his wife Merit. It was the richest and most complete non-royal burial assemblage ever discovered. Grave-goods include coffins tunics, beds, vases, cosmetics and prestigious luxury objects inscribed with royal names, which allowed to date his career between the reigns of Amenhotep II and Amenhotep III (1425-1353 BC). The grave-goods of Kha also include alabaster containers, ceramic vessels and jars for food, oil, powders and precious perfumes. Researchers from NAST Centre applied for the first time non-invasive macro scan X-ray Fluorescence imaging (MA-XRF) to the Kha artifacts. 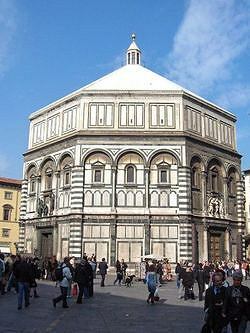 The NAST Centre led an experimental team which included researchers from CNR Istituto per i Beni Archeologici e Monumentali (IBAM) of Catania and Istituto per i Processi Chimico Fisici (IPCF) of Messina, Museo Storico della Fisica e Centro Studi e Ricerche Enrico Fermi, the Museo delle Antichità Egizie di Torino and Soprintendenza Archeologia del Piemonte, Università degli Studi di Milano-Bicocca. The experimental apparatus was developed within a collaboration with CNR-IBAM and LANDIS laboratory of INFN-LNS. The new scanning methodology provided high-resolution images of the elemental distribution on the investigated paintings. Preliminary results from the XRF scans of the Egyptian painted caskets coming for the Kha tomb already provided precious indications about the painting techniques applied, presence of different hands and their conservation status. The measurement campaign was performed in June 2016 at the Museo Egizio di Torino in the framework of a wider project aiming at the characterization of the intact Kha burial assemblage. ARKHA (ARchaeology of the invisible: unveiling the grave goods of KHA) project. 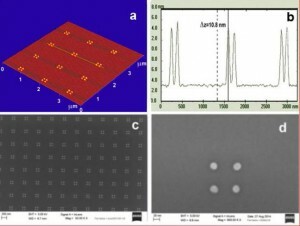 Objective of the study is to characterize the “Kha and Merit collection” by the integrated use of non invasive and non destructive chemical and physical techniques by the integrated use of light and neutron probes. ARKHA combines competences of scientists belonging to different disciplinary fields, i.e curators, restorations, Egyptologists, archeologists, chemists and physicists. In stark contrast to the crystalline state, amorphous material display a complete lank of long range structural order. In the case of ice it came as a huge surprise that several different amorphous ices exist and they have been classified according to their densities. 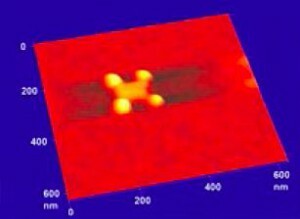 The waters molecules in ice are held together through hydrogen bonds and we have set aut to investigate how changes in density affect hydrogen bonding and nuclear quantum effects of the hydrogen atoms. Date from the Vesuvio instruments showed a pronounced softening of the O-H stretching potential in the low-density ice compared with the higher- density ices. Moreover, the hydrogen mean kinetic energy was found to increase with increasing density indicating the weakening of hydrogen bonds as well as steeper and more harmonic hydrogen vibrational potential energy surface. 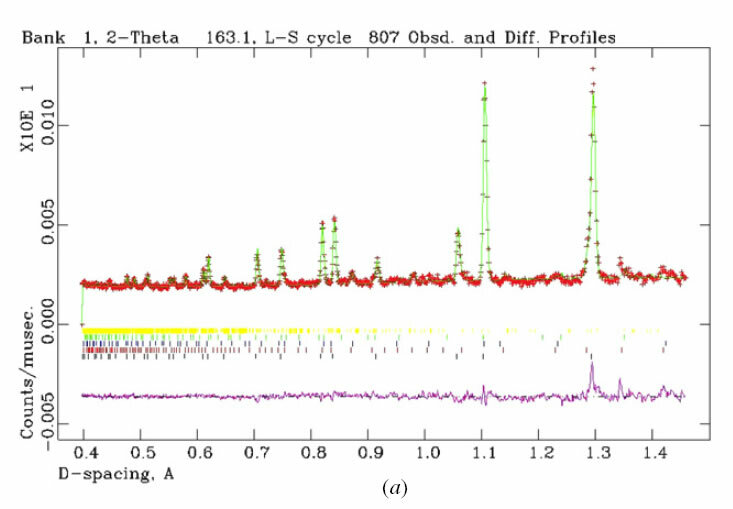 In a novel approach, we used data from both the Vesuvio and Maria instruments to determine the anharmonicity constants of the O-H stretching modes. We then arrived at a very simple conclusion : hydrogen banding is the main cause for anharmonicity in amorphous ice. Evolution :A. Parmentier ( Università degli Studi di Roma Tor Vergata, Italy), JJ Shephard ( University College London and Durham University), G. Romanelli ( Università degli Studi di Roma Tor Vergata, Italy, and ISIS), R. Senesi (Università degli Studi di Roma Tor Vergata and CNR-IPCF sezione di Messina, Italy), C.G. Salzmann (University College London) C. Andreani ( Universita degli Studi di Roma Tor Vergata, Italy). 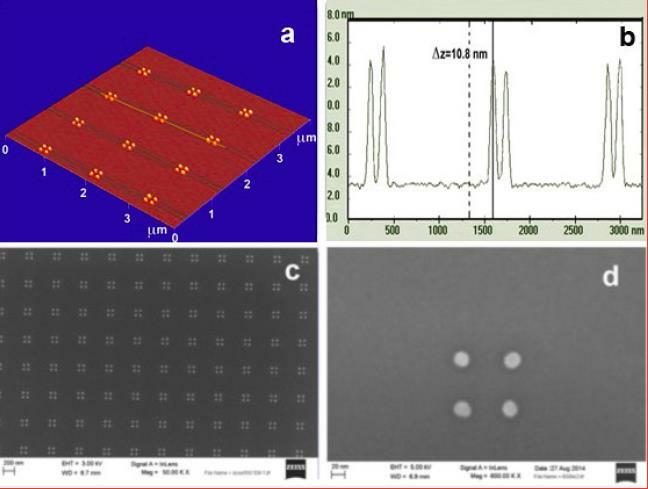 Archaeological samples can be study via neutron resonances that can be used as fingerprints to identify and quantify elements within the bulk of the objects in a non-destructive and non-invasive manner. Neutron Resonance Transmission Imaging (NRTI) has been successfully applied to the 3D elemental mapping of archaeological samples. 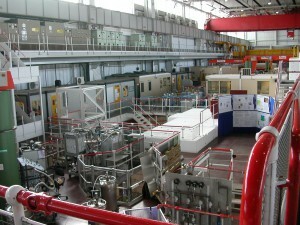 A dedicated set-up at the INES (Italian Neutron Experimental Station) beamline of the ISIS spallation neutron source was used for the experiments. The archaeological sample is an early mediaeval disk fibula coming from the Hungarian National Museum in Budapest. Experimental hall of the ISIS spallation neutron source. 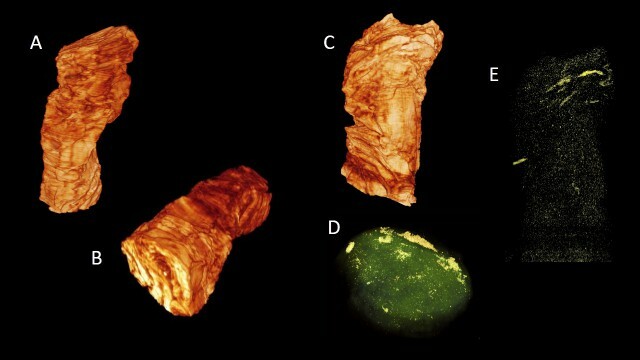 Three-dimensional (3D) elemental imaging reconstruction of an ancient artefact by Neutron Resonance Transmission (NRT) was performed for the first time. NRT is a neutron technique based on the presence of a resonance structure in the neutron-induced reaction cross sections. These resonances allow the identification of elements and isotopes within the sample. 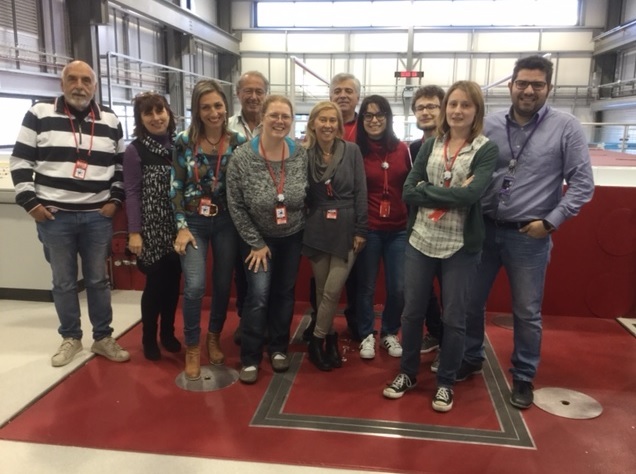 A dedicated set-up on INES (Italian Neutron Experimental Station) beamline of the ISIS spallation neutron source was used for the experiments. 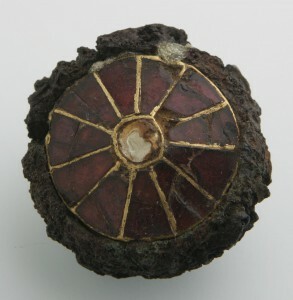 The investigated artefact was an early mediaeval disc fibula from the Hungarian National Museum in Budapest, Hungary. The simulation group develops Monte Carlo simulations to study neutron related techniques. Simulations are used to study the feasibility of the neutron logging technique for cultural heritage applications, improve the neutron capture prompt gamma activation analysis, and investigate the sources of gamma ray background in pulsed neutron source facilities. The simulations are based on the well-estiblished Geant4 and ROOT codes. 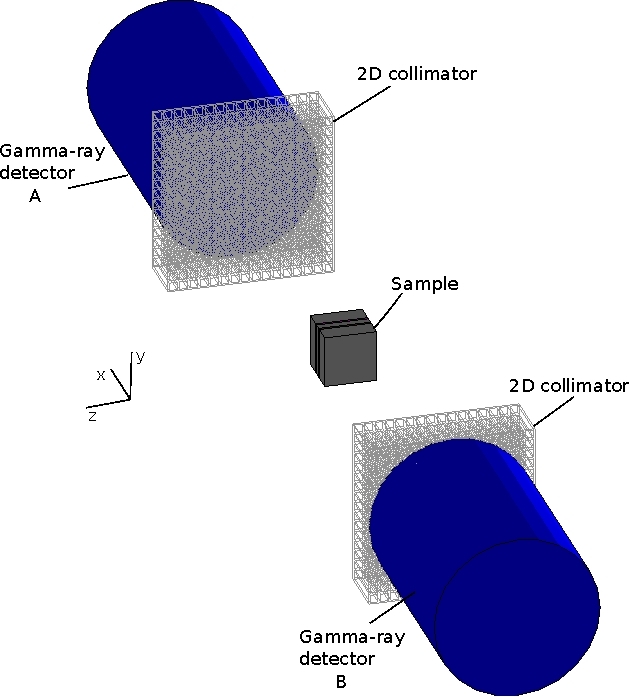 Neutron-gamma logging is a nuclear technique based on measurements of gamma radiation emitted after excitation by a neutron source. The technique involves the use of a source of neutron radiation and a gamma detector lowered in a borehole. Neutrons produced by the neutron generator are slowed down through scattering with the nuclei of the material surrounding the borehole and are eventually absorbed. The gamma radiation yields information on the materials present in the irradiated volume and, in principle, can be used to sample unexcavated area and spot the presence of buried archeological artifacts. The technique has been successfully applied in mining industry and geology. We investigate the feasibility of the technique for applications in cultural heritage by using Monte Carlo techniques. A simulation model of a neutron logging system based on Geant4 has been developed to this aim. 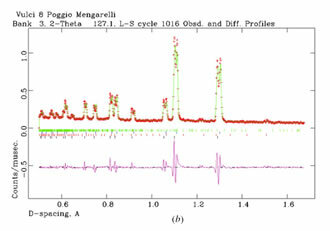 Neutron capture prompt gamma activation analysis (PGAA) is a non-destructive analytical technique that provides information on the isotopic composition in samples. It based on the measurements of gamma-rays following neutron capture. The pattern of gamma-rays, ranging from hundred keV to 12 MeV, is unique for each isotope. The PGAA method has been applied in materials science, chemistry, geology, mining, archaeology, environment, food analysis, and medicine. A current limitation of the technique is gamma-ray self-absorption. Attenuation of gamma-rays within the sample itself that may lead to significant errors. 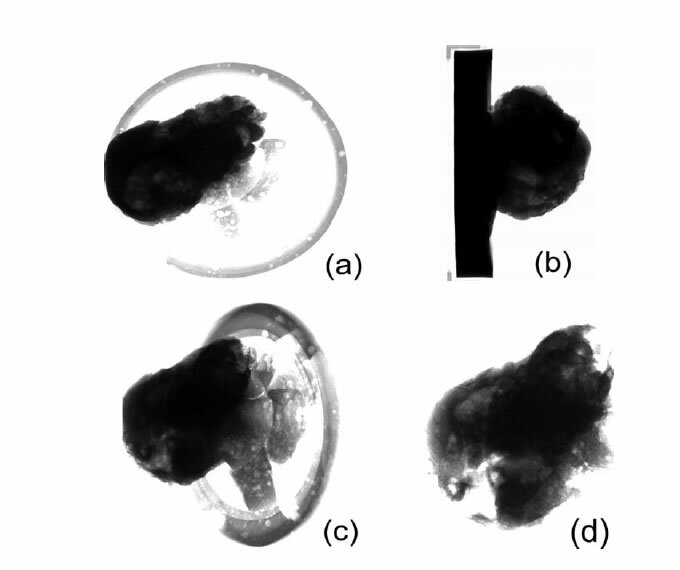 We plan to exploit the gamma-ray self-absorption and investigate the feasibility of using low energies gamma-rays (< 1 MeV) to localize inclusions. 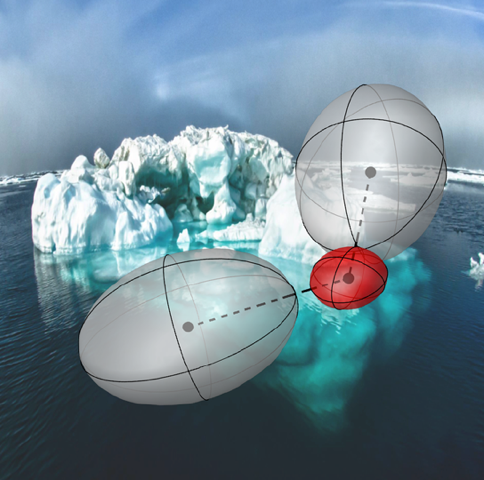 Spatial distribution of elements has recently been measured by scanning a sample with a collimated neutron beam and by using a collimated gamma detector. Drawback of the technique is the high collimation of source and detector needed and the long beamtime required. Our method will make use of the full neutron beam area and allow for a fast localization of the inclusions. Information on position of the inclusion could be used to correct for the self-absorption and obtain more precise quantitative analysis. 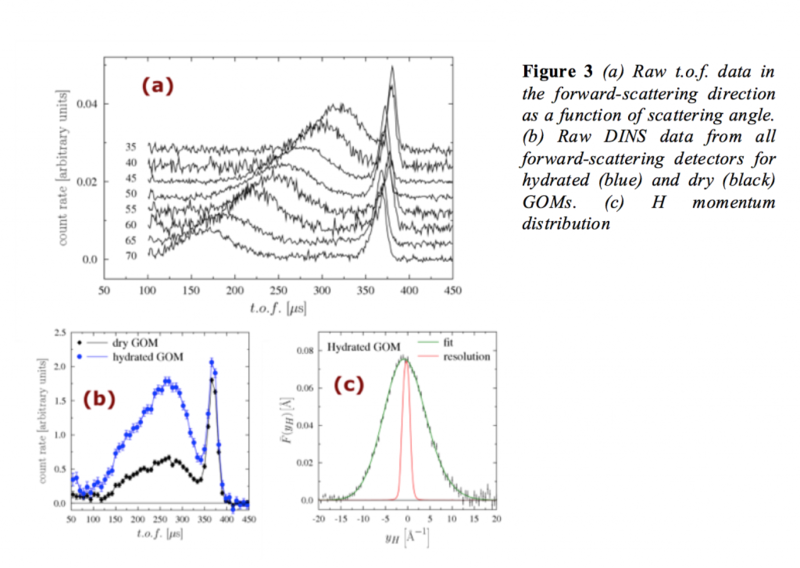 The studiy of the feasibility of the method and the optimization of the detectors’ geometry are carried out with Geant4 based Monte Carlo simulations. Spallation neutron sources offer an unique opportunity for fundamental and applied science. The wide neutron spectrum produced from the spallation reaction ranges from meV to several MeV. At the ISIS pulsed neutron source, neutrons in the meV – eV region are employed, among other techniques, for diffraction and inelastic scattering. Neutrons in the eV-keV region are utilized for neutron imaging. High energy neutrons (MeV region) are used for electronic devices testing. One aspect to be considered in all applications is the gamma ray background. A clear estimation of the background and identification of the sources is of prime importance to increase the signal to noise ratio. We are developing a simulation tool based on Geant4 to investigate the sources of gamma radiation inside the blockhouse and reduce their contributions to the measurements. Collaborative research among University, public institutions and private enterprises for the development of biological Fuel Cells and Electrolysis Cells for the production of energy or Hydrogen. 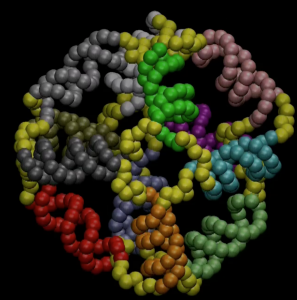 Spider fibers are an exceptionally resistant material based on the fibroin protein. The most obviuous property of spider fibers is however that they can be meters long but they are micro- or even nanometric in their cross section. This makes it relatively easy and inexpensive to manipulate the fibers and exploit their nanometric size properties. Furthermore, in spite of their sizes, due to their non uniform density, spider silks are efficient scatterers of visible radiation, which makes them easily observable with inexpensive equipment, contributing to the ease of manipulation. 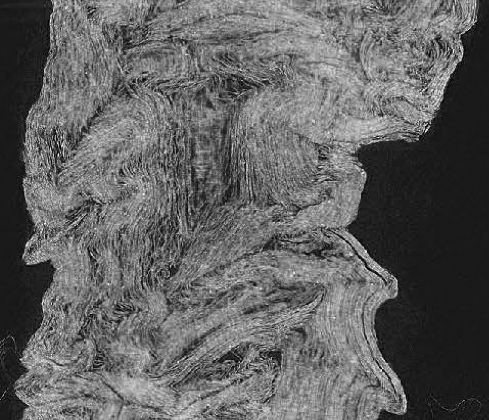 Fibers are often composed of fibrils that can be as thin as a few tens of nm, reaching thus the range of sizes of other natural exploitable nanoobjects such as rod type or filamentous and bacteriophage viruses. 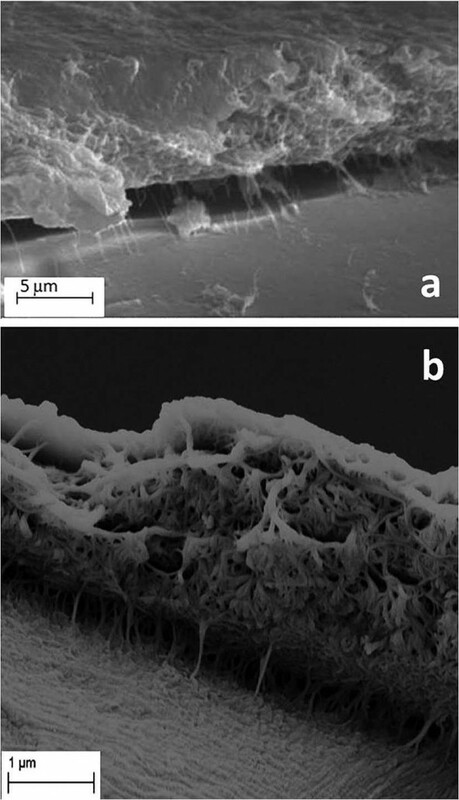 After separating such fibrils from the bundle, The NAST Center team in collaboration with the ENEA Casaccia Surface Science laboratory used them for two simple nanotechnological applications: 1) as shadow masks to obtain extremely small and controllable nanogaps separating metal electrodes; 2) as a mechanical support to produce metallic micro- and nanowires. 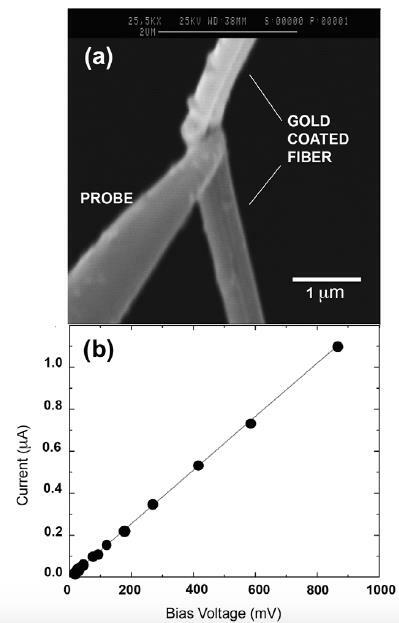 Insulating gaps as narrow as 15 nm were obtained between gold electrodes over distances in the range of 10-3 or even 10-2 m. Gold was thermally evaporated on nanofibers, stretched across a slightly curved mica slab in order to obain a good adhesion; by rotation of the slab around an axis nearly corresponding to the adhering fiber, the designed shadow was made much smaller than the fiber itself. 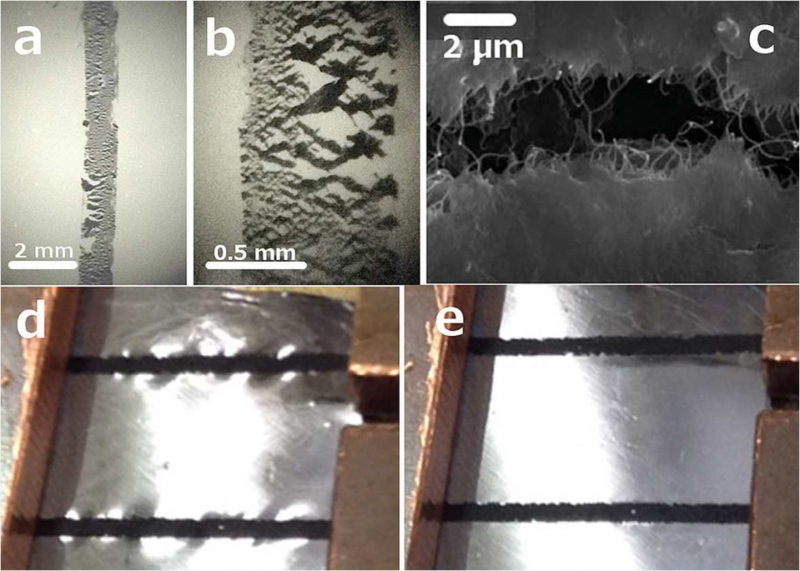 different sizes, while figure 2 shows the lower insulating properties of a 2 cm long gap with respect to a 1 mm long gap. Fibers were also gold coated uniformly all around by means of a suitable holder and their electrical conduction was probed. 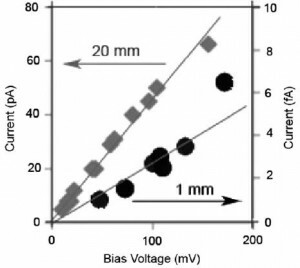 Figure 3 shows a linear, ohmic behaviour, which is maintained by slightly stretching the wire, while it drops to zero when stretched by more than 2% of it length. The ease of manipulation of spider fibers and the negligible cost of fabrication of nano-gaps and wires makes this method extremely useful for the straightforward assemblage and electrical connection of experimental microdevices, such as in the development and testing of lab-on-the-chip type 3D systems. Collaborative research among scientists from Nast Centre, CNR , Università di Milano-Bicocca and Cultural Heritage Institutions – Italian Ministry for Cultural Heritage, Opificio delle Pietre Dure , Museo Nazionale di Villa Giulia , Museo Civiche Raccolte Archeologiche e Numismatiche di Milano have investigated archaeological artefacts via integrated neutron techniques. Neutron techniques are applied to cultural heritage artifacts to ‘unveil secrets’ in ancient objects. Measurements are devoted to study structural characteristics like composition, presence of alteration, crusts, inclusions, structure of the bulk, manufacturing techniques and presence of those elements which give us an overall ﬁngerprint of the object’s characteristics. Neutrons penetrate through objects without substantial attenuation, a quality which makes them ideal for bulk, non-destructive testing. Neutron Diffraction (ND) is a method to study the crystal structure of the object. 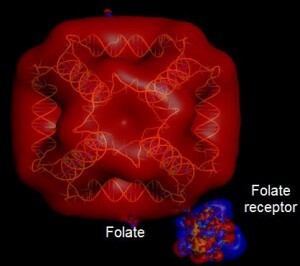 Components and their crystal structure can be detected. Neutron Tomography (NT) is a method of testing the internal structure of an object. A neutron beam impinging onto any heterogeneous object is differently transmitted depending on thickness, density, chemical composition and total cross section of the material along the line of sight. 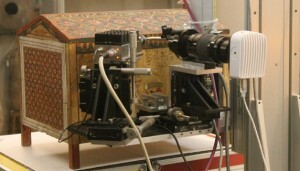 Recording the transmitted beam is possible to reconstruct the internal feature of the studied object. 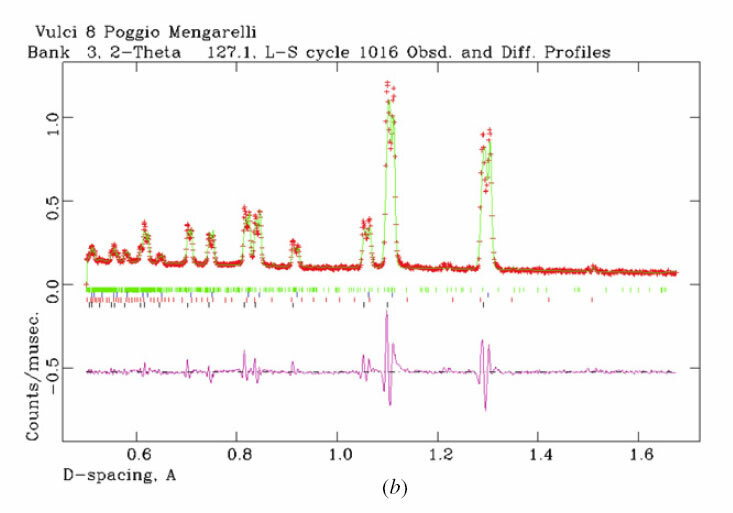 Prompt Gamma Activation Analysis (PGAA) and the newly Prompt Gamma Activation Imaging (PGAI) use thermal neutrons to detect and map the elemental composition of the irradiated samples. Neutron Resonance Capture Analysis (NRCA) use epithermal neutrons to detect elements and their isotopes in the irradiated sample. 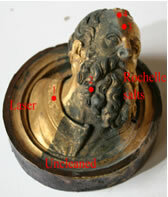 All these techniques are used as success applied to the study of cultural heritage objects. Following some studied cases. This work is addressed to integrated neutron techniques for the study of an artifact, a gilded bronze relief, part of the most monumental Door, The Gates of Paradise, located at the Battistero di Firenze, masterpiece of the Florentine Renaissance by Lorenzo Ghiberti. The relief presents critical aspects regarding state of conservation and shows a re-melting whose extension and composition were unknown. The analysis was performed using Prompt Gamma Activation Imaging to reconstruct the elemental composition map, Neutron Diffraction and Radiography for an insight to manufacturing technique, and Neutron Resonance Transmission to map the gold layer distribution under the pollution deposits. PGAI use thermal neutrons to map the elemental composition of the samples. 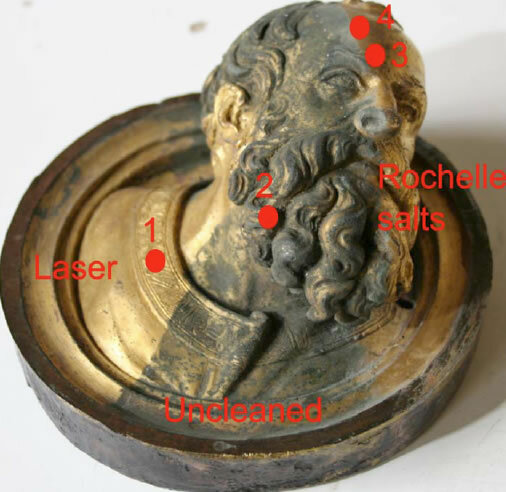 Prophet Head contains: Cu, Au, Hg, Cl in the uncleaned part; Cu, Au, Hg in the area cleaned via Rochelle salts and Cu, Au, Hg and Cl in the area cleaned via laser ablation. Cl presence in the laser-cleaned area is relevant: Cl compounds represent a dangerous component as far as the corrosion processes is concerned. High resolution neutron radiographies provided the extension and position of the re-melting area in the relief. 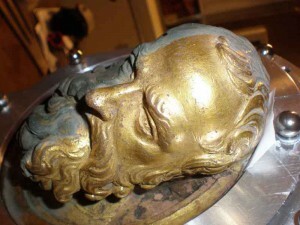 This suggests that, because the original melting was not satisfactory, the sculptor made a second one. 3) it was demonstrated that the face and beard region were part of the second melting. Re-melting seems to have been realized by the artist to give thickness to the relief and make it much more hard-wearing. Etruscan bronzes coming from the Museo Nazionale di Villa Giulia, Rome, Italy were studied by Neutron Diffraction. 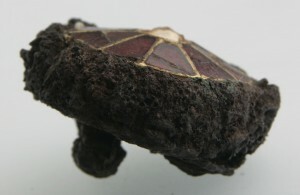 The aim of the study was to collect information related to the main composition of the artefacts, the presence and nature of alterations or inclusions and the bulk structure to define the corrosion state, the past environments and the physical/chemical events that transformed the objects into partially corroded matrix. 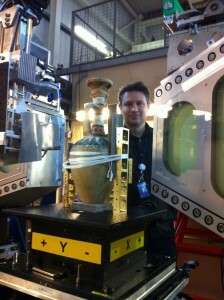 The experiments were carried out at ISIS spallation neutron source. The bronze vases are part of an Etruscan collection discovered in the necropolises of Osteria-Poggio Mengarelli and Cavalupo in the outskirts of Vulci (Viterbo, Italy). The samples, 14 fragments, were analysed with regard to chemical-phase compositions and corrosion products. Bronze is composed of copper, tin (Cu, 85-95%, Sn, 5-15%) and small quantities of other metals. The determination of the exact copper/tin/lead relative composition provides important information on the working process and technologies adopted and, indirectly, on the authenticity of the artefacts. Results obtained from ND investigation of objects show that 60% to 95% by weight is un-corroded alloy that presents a composition (Cu = 90±4%) which is typical of low-tin ancient bronzes thus supporting the authenticity of the samples. 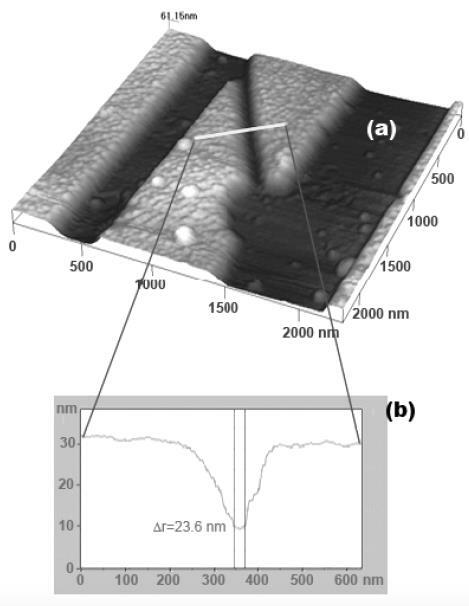 ND measurements also provided information about working methods of bronzes through the analysis of relative bronze peaks width Dd/d as a function of d-spacing: annealing and two different types of cooling dynamics (fast and slow) are present while hammering could also be present. 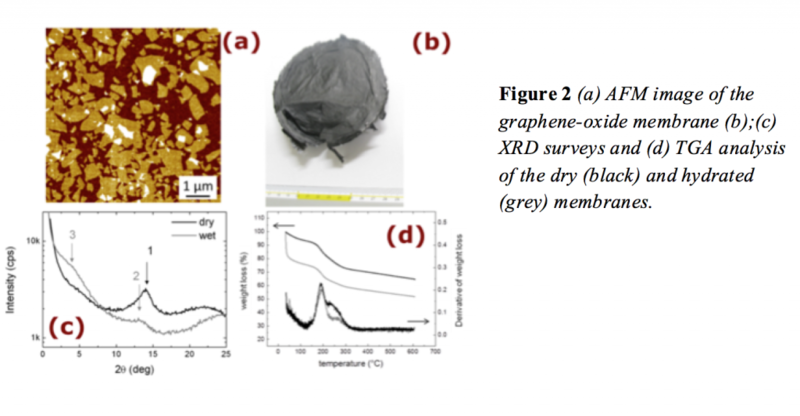 Furthermore data analysis showed that the combination of corrosion products in the single samples is in agreement with possible environmental conditions in which the objects were in contact. Most of the samples were buried. Some of these were in contact with salted water. This could come from seawater percolation or simply salted food contained in the vases. Additionally it has been possible to trace probable quantitative values for the concentration of certain environment components such as CO2 and NaCl present in the tombs. G. Festa, P. A. Caroppi, A. Filabozzi, C. Andreani, M. L. Arancio, R. Triolo, F. Lo Celso, V. Benfante, S. Imberti ‘Composition and corrosion phases of Etruscan Bronzes from Villanovan Age’, Measurements Science and Technology, 19, 034004 (2008). A neutron tomography study was performed at the Antares experimental station of the FRMII reactor (Garching, near Munich) on an Etruscan little vase preserved at the Civiche Raccolte Archeologiche e Numismatiche (Milan, Italy). This is and Aryballos vase of Proto-Corinthian style (6-7th BC) and comes from the necropolis of the Banditaccia, in Cerveteri. It is made in ceramic material (5.9 cm height), with a globular body and a decoration with large and horizontal brown bands. It has an original cap still sealed and intact and the content is unknown. 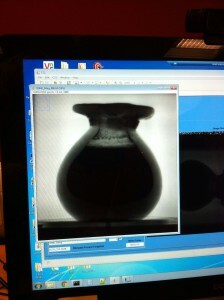 Aim of the study was to non-invasively observe the internal features of a sealed vase. The analysis shows that the content is a fine powder well-preserved. Aryballos proto-corinthian vase from the necropolis of the Banditaccia, in Cerveteri. 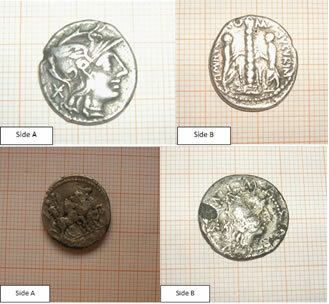 A neutron diffraction study was performed on a series of ancient silver coins belonging to the Strait of Messina area (264- 241 b.C. e 218-202 A.D.). The aim of the study was to evaluate authenticity and, accordingly, to bear out an hypothesis of historical forgery. The discovery of an ancient artifact often raises a variety of questions such as the correct determination of its historical and cultural time-frame, the place and method of production, the choice of treatments and conditions for restoration and preservation. In this field, new perspectives open up with the use of neutron-based techniques. Neutrons, in fact, show a high penetration power through thick coatings or probable corrosion layers present in the sample, and provide information from the bulk rather than from surface areas. The period in which silver coins where introduced in Roman era is not exactly known but it is reasonably dated in the period of the Punic Wars (ﬁrst: 264 − 241 BC and second: 218 − 202 BC), series of three wars fought between Rome and Carthage. In that period a big amount of money became necessary to cover war-expenditures. During this century a very large number of ‘fakes’ coins were used. It is not clear if they were made by the Roman Republic or they are forger work. This phenomenon regards, in particular, silver coins. The ‘authentic’ and the ‘fakes’ coins can be tell apart by eye because the ‘fakes’ have a core by copper or lead and an external layer made in silver. All the samples are republican-roman money delivered by Roma’s mint. The objects under study have been kindly furnished, within a long collaboration with IPCF-CNR, from the foundation Piccolo Museo S. Paolo in Reggio Calabria (Italy), here a very valuable numismatic collection belonging to a period ranging from the ancient Magna Grecia to nowadays.Diffraction measurements were used in the characterization of the quantitative composition of the bulk of the coins. 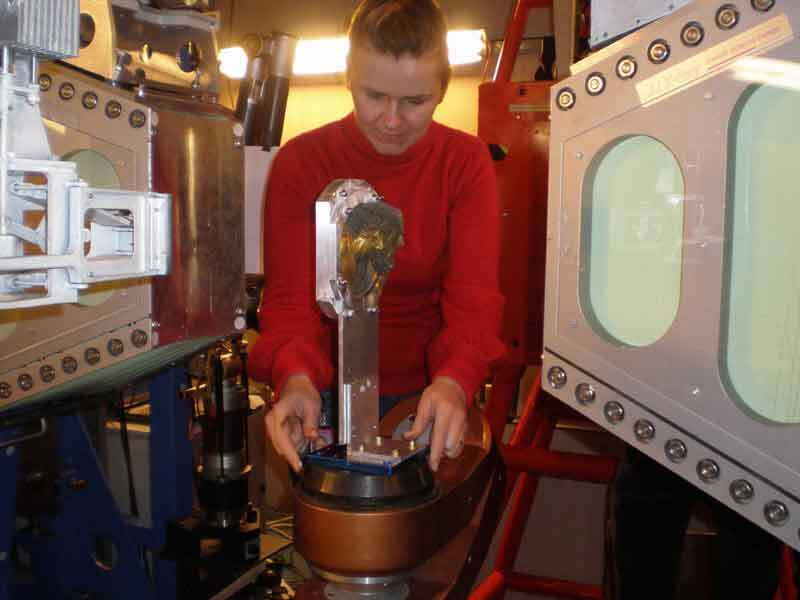 All the elemental analysis measurements have been performed at the INES station (Rutherford Appleton Laboratory, UK) and a complete phases distribution is provided. The analysis of the diﬀraction measurements on the ancient coins shows the diﬀerence in composition: one of these is composed by only silver and it can be hold as authentic, instead two other coins are composed by a nucleus of copper with a cuprite patina and a silver covering and are clearly fakes.